Zhuhai city, is a city which is always faces with the strong winds and comes with the typhoon, therefore, each year, the trees in Liri Factory will be bown down under the typhoon, therefore, trees are easy to bown down, how about the temporary structures? Liri Tent is the biggest tent manufacturer, and we use many tents in the factory for warehouse and showroom purpose. During the “Lotus” effect,eastern coast and northern Guangdong will appear heavy rain storms heavy rainfall,accumulated rainfall of up to 250-350 mm in the process,part of the site may be more than 400 mm. 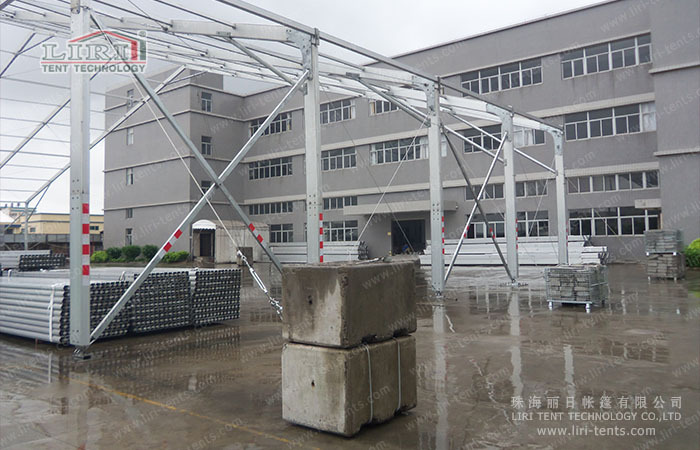 In previous years,Liri 40m clear span big tent were still safe and sound under the typhoon. Because we know how to protect the warehouse tent when the strong winds hits. Follow, please check some methods. 1. In the case of wind speed is 8 magnitude and below,first of all,tension bar around the sidewalls need to cling close to the ground,the rope buckle between each bay sidewalls should be strained up,which make the tent form a completely closed space that wind are not permitted to enter. Second,standard counter weight should be carried out according to the tent type specifications. Also,to be on the safe side,it need to pull cable-stayed steel to reinforce the tent at the four corners at least,the best at each bay. 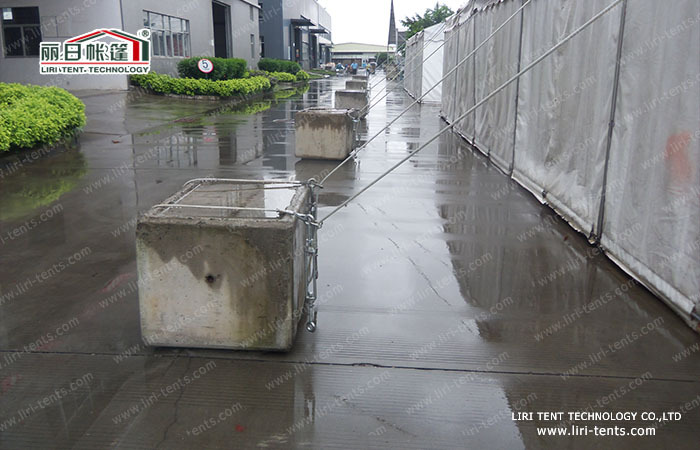 In previous years,the reinforcement way of Liri 40m clear span big tent under the typhoon. 2. In the case of wind speed is over 8 magnitude,if the time,labor and other conditions permit,it is best to dismantle tents,and re-build them after the typhoon; If not,the roof cover and sidewalls should be removed,leaving only the tent frame,and evacuate the staff and valuables,to avoid unnecessary losses. Liri Tent manufacturer select the excellent material,adopt the high-strength aluminum alloy for the tent frame,hot dipped galvanized steel for the connectors. Under the normal installation and fixing conditions,Liri Tents can withstand 8-10 magnitude strong winds. Even durable as Liri Tents that with excellent wind resistance,but when the wind speed faster and faster,the weather becomes more and more severe,staff need to be evacuated quickly. After all,the tents are only the temporary outdoor construction,not the shelter in the strong winds. In previous years,Liri 50m clear span big tent were still stand there under the typhoon.